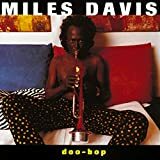 Doo-bop was Miles Davis’ last album, released posthumously. It was my first Miles Davis album and I loved it. Listening to Doo-Bop (buy it now) now, it ends up sounding a little dated – when I was listening to it out-loud the other night, someone said it sounded worse than elevator music – like the kind of music the dentist plays. Objectively I have to agree at least a little – the samples, drumbeats, and other material sound a little trite at this late date. But Miles is still there, wailing away – and I still groove out to the best tracks. One of my favorites is the opening track, “Mystery”. It is ethereal – just out there. The trumpet comes in like a beacon from the edges of space and touches the eardrums, offering a whole new sound experience. A review on Amazon described the track as a “seductive groove of downtempo heaven that really brings out the best in Miles’s trumpeting” and I must agree. After the more traditional sounds of Wynton Marsalis and the big band Dirty Dozen, the hip-hop infused Doo-bop was liberating, a whole different way jazz could sound, a trumpet amid an army of electronica. The sound was new and exciting for me then – and I still hear it that way, even if it sounds to a new ear now like tired riffs. Of course, even compared to the hip-hop of the time (at the time I think I also owned A Tribe Called Quest’s The Low End Theory) this album is behind the curve, but Miles Davis is a musical genius – and that genius shines through even on this album. I went on to enjoy a lot of other Acid Jazz (like Karl Denson and St. Germain) and a lot of other Miles Davis. But Doo-Bop always will have a special place in my heart as my introduction to Miles. This is the third in a series detailing my personal jazz history. You can read the series here. This entry was posted on September 20, 2004 at 11:47 pm and is filed under A Personal History: Jazz. You can follow any responses to this entry through the RSS 2.0 feed. Responses are currently closed, but you can trackback from your own site.